You may have noticed those green trash bins marked “Zero Waste” at football games or other large public events on the University of Colorado’s Boulder campus. And you may also have noticed some people standing beside those bins, patiently explaining which piece of “trash” goes where. Welcome to the campaign for sustainability, University of Colorado-style. And meet Sarah Dawn Haynes, programs assistant for the Environmental Center at CU Boulder, whose job it is to assist with and promote the Center’s Zero Waste and sustainability programs, making sure the university properly handles its trash. 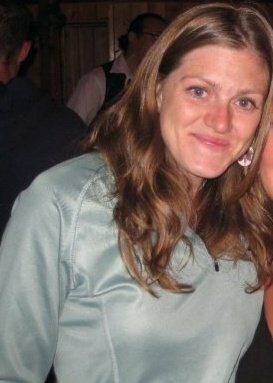 Haynes begun her association with the Center as a student employee and graduated with a degree in environmental policy. When a newly created position opened up in the 40-year-old organization, Haynes’ full-time passion became a full-time job. Haynes sees herself and her staff as advocates for sustainability on campus. The Center is an umbrella organization whose work extends to several areas of ecological concern on campus and beyond, including recycling, transportation and energy conservation. As part of this mission, Haynes and her staff promote the use of Regional Transportation District bus passes by students and faculty as a way of decreasing the twin vices of cars — air pollution and traffic. They work with Moe Tabrizi, CU Boulder’s chief energy conversation officer, to promote wise energy use. 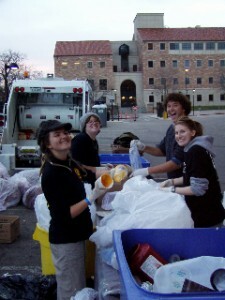 And they oversee CU’s always-evolving recycling program — thought to be the oldest college-campus program of its kind in the country. Her position at the Environmental Center being rather amorphous and self-directed, Haynes does everything from bolstering awareness about proper waste management through signage and outreach events, to working directly with vendors at large events such as football games to ensure they’re doing all they can to be environmentally friendly, such as by using recyclable eating utensils. “It’s all pretty groovy,” said Haynes about how, in only three years, she and the Environmental Center have pulled off what she calls a “complete overhaul” of how the Boulder campus approaches sustainability. Though she notes that quite a bit of her job is that of a “bureaucrat” these days, Haynes is still on site at events with the people she calls her “Zero Waste Goalies,” keeping watch over the green trash-bin stations, advising attendees about which trash goes in which receptacle. If there’s even a three-percent mix-up or “contamination” in the material gathered by Haynes and her Goalies, all the waste will have to go to a landfill instead of being sold to companies such as EcoCycle for further processing. Hence, you’ll find Haynes and her Goalies going through the trash collected at events to ensure that there’s only compost waste in the compost bins and recyclable waste in the recycling bins. For Haynes, it’s all about keeping waste management fun and engaging, whether it’s talking to football fans as they discard trash or poring through the trash with her staff and volunteers. Learn more at the Environmental Center’s website. Also, Haynes and other local ecology enthusiasts invite you to get psyched up for this year’s Bioneers Conference, Nov. 5-7.